It is so easy for me to work with pinks and florals and feminine style. And this Sugar Chic collection from Heidi Swapp is no exception. 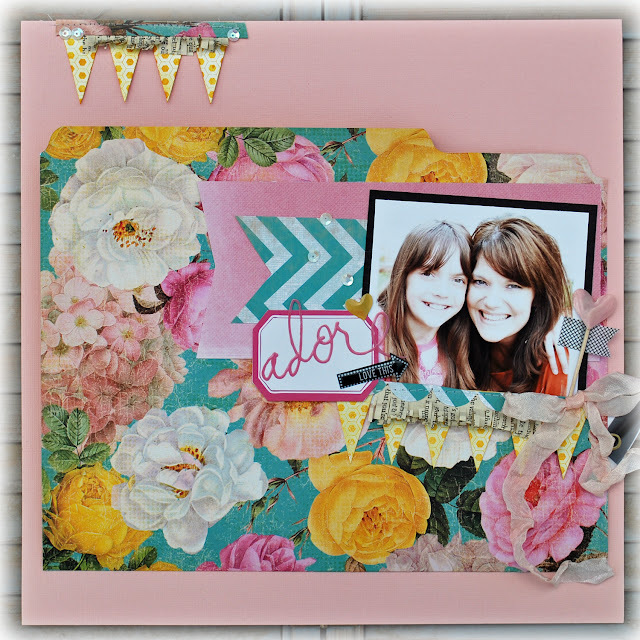 The 'adore' memory file is one I submitted to the Heidi Swapp Media team call. I had to make the file myself as there were none in the area to purchase. The file front is attached to 12x12 solid card stock. 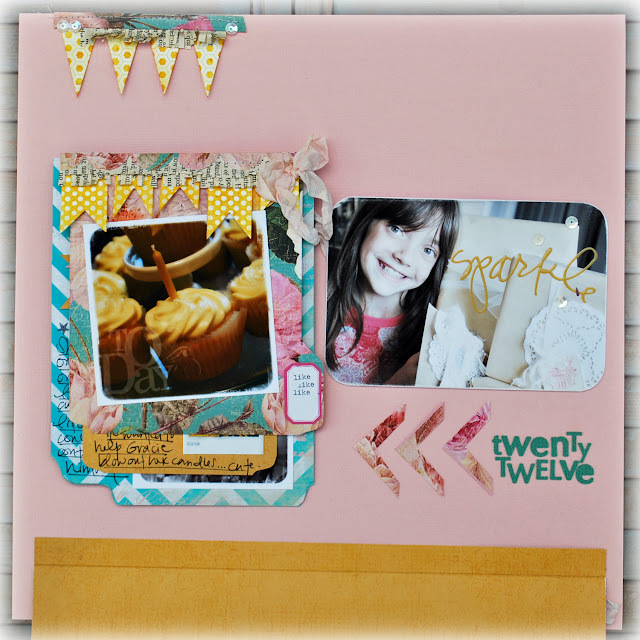 The front of the file is adorned mostly with Heidi Swapp lovlies: notched cut pattern paper, color labels, an 'adore' buzz word plus arrow, some color magic banner delights misted in yellow. I added sequins, (because that's what I do), book paper fringe, washi tape and dyed seam binding. The photo was taken with my eleven year old on her birthday. She is my 'mini-me' in so many ways. She is also the 'one' I worry about. So this memory file is about her and her birthday celebration. The file opens to another 4x6 of my girl, plus a home made photo stack chronicling the rest of the evenings events. Love how the buzz words looks on a photo. They have a digi-hybrid look to them, but in real life, there is that texture that I love too. And I want to say a shout out to Heidi for her sweet words of introduction on her blog today. Come back by her blog tomorrow for one final team member you will be amazed by. Congrats on the new gig!!! I adore your work. These pages are beautiful! Love it and your blog! Hi Jamie! Super huge congrats to you on your new DT gig! Heidi is very lucky to have you! I LOVE this fabulous file folder layout. Such a clever way to hide additional photos and journaling, and what a gorgeous, feminine design. Really LOVE this!